Famous faces included Hudson Taylor, The Coronas, Róisín O and Imelda May. Dublin's annual Christmas Eve busk took place just outside the Gaiety Theatre last night just after 5pm. With all proceeds going to the Dublin Simon Community, famous faces took to the streets to do some real good, for the season that's in it. 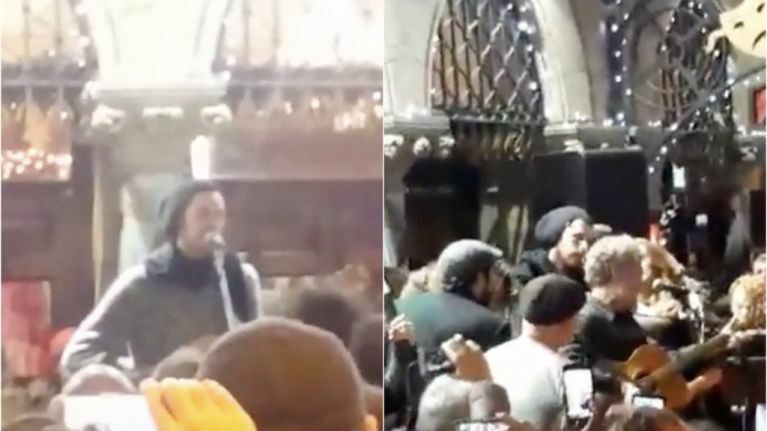 Eagle-eyed Irish music enthusiasts were quick to notice that U2 frontman and long-standing Christmas Eve busker Bono wasn't there. But what we lacked in Paul Hewson, we made up in young Irish talent as a whole host of new faces took to the streets. Kodaline, Bell X1, Imelda May, The Coronas and Hozier were amongst the Irish musicians performing in the city, with Hozier taking the fan-favourite spot at the top with his incredible song 'To Be Alone'. All proceeds from the busk go to the Dublin Simon Community, who work to prevent and address homelessness in Dublin, Kildare, Wicklow and Meath. If you'd like to donate to the Simon Community, you can do so right here.